Pick the 3 shows you would like to see. Pick the performances you would like to attend. Save 10% off single ticket pricing. With a VIP PACKAGE upgrade, you will enjoy complimentary parking and exclusive access to the refurbished BROADWAY CLUB featuring a private bartender, specialty drinks, complimentary light snacks, coffee, and tea. VIPs can also pre-order their drinks for intermission in the Broadway Club. Access to the Broadway Club includes both the private lounge and private restrooms before each performance and during intermission. 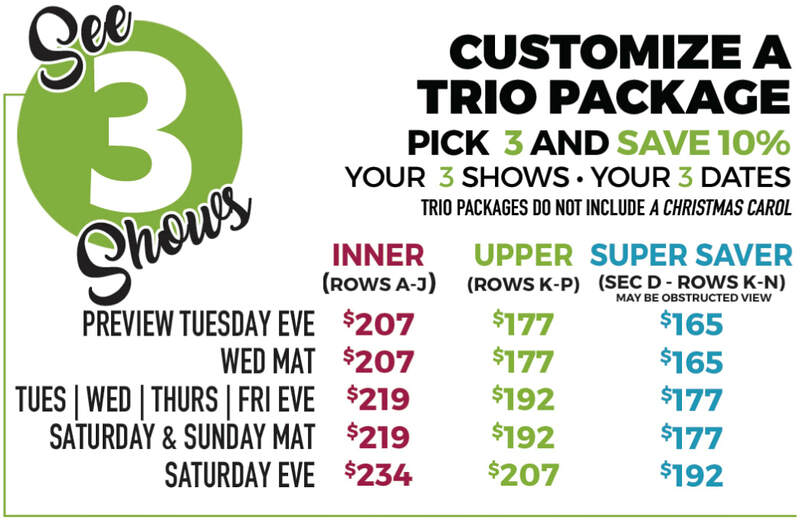 FOR THOSE WHO BUY TRIO SHOW PACKAGE ONLY.